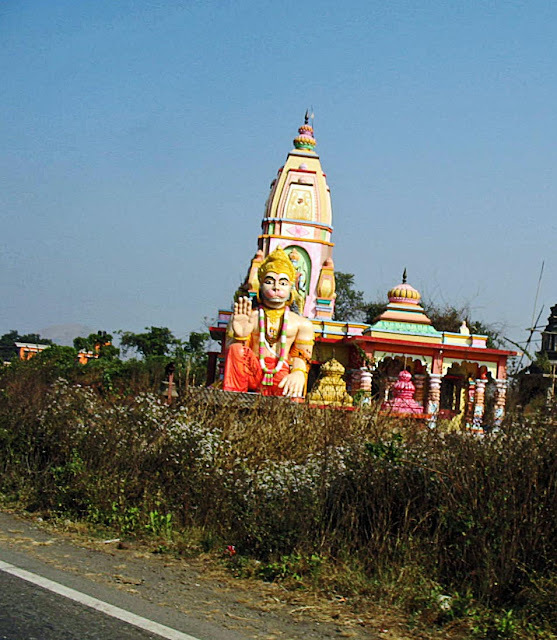 Here are photographs of a brightly painted Hanuman Temple on the Old Mumbai-Pune Highway. 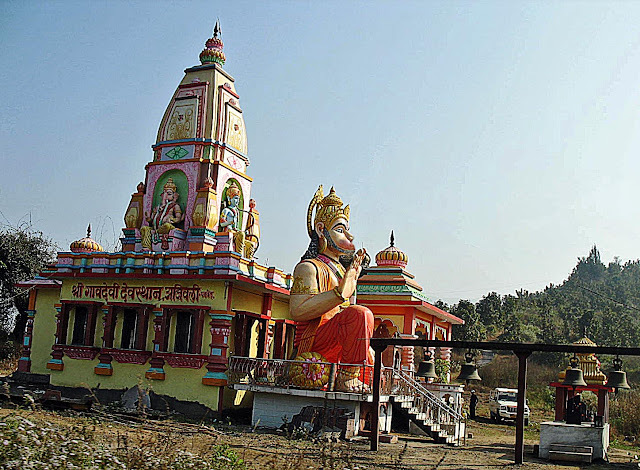 It has a gigantic statue of Hanuman outside the temple. Hanuman is a Hindu deity, and a major character in the Indian epic Ramayana. He is a disciple of Lord Sri Rama and fights with him against the demon king Ravana. He is so revered that He is worshipped in Hinduism and has temples (Hanuman Mandirs) devoted solely to Him. This view is from the side and the intricately painted statue of Hanuman and the steeple of the temple are clearly seen. To the right of the image there are two pairs of bells which are part and parcel of every Hindu Temple. This is a view from the front. A small part of the highway and bushes can be seen in the foreground. Check out some Temple Silhouettes or some pictures of an Ancient Narsimha Temple in Pune in Maharashtra, India.